Scientists tend to speak of glaciers as if they were living creatures. They say they grow and die and have good health and bad. Now, with Halloween approaching, a handful of researchers has found a way that the anthropomorphized rivers of ice that they study can simultaneously live and die as the globe warms. The discovery of a ghoulishly semi-lifeless glacier in southeastern Iceland doesn’t just create a new zombie class of frozen rivers of water. It raises questions about the accuracy of conventional approaches to measuring the growth and retreat of similar glaciers. 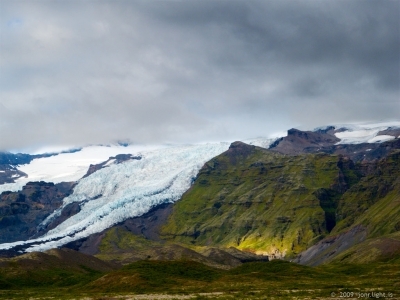 A portion of the Falljökull glacier in Skaftafell National Park, Iceland. When a glacier is said to be alive, it grows by gobbling up frozen snowpack during warmer months, often adding more ice than it loses to melting. During the colder season it expands downhill, growing in mass and length, sometimes carving out great valleys as it goes. The glacier doesn’t just add ice around its peripheries; its entire mass heaves as it waxes in winter and wanes in summer. When a glacier is said to be dying, as so many are today due to rising temperatures, it has been thought to do so in one of two ways. It can retreat, with summer melt rates outpacing the absorption of new ice. Or it can stagnate and wither, like an errant ice cube leaving a puddle on the kitchen linoleum. But scientists who used a combination of satellites, ground-pentrating radar and remote-sensing LiDAR technology to peer deep inside the Falljökull glacier during a 12-month period discovered a response to warmer weather that hasn’t previously been documented. “Falljökull doesn't fit into either of these pigeon holes,” said scientist Emrys Phillips, one of five British Geological Survey researchers who described their discovery in the Journal of Geophysical Research: Earth Surface. Living parts of the glacier appear to have sloughed away the dead bits. 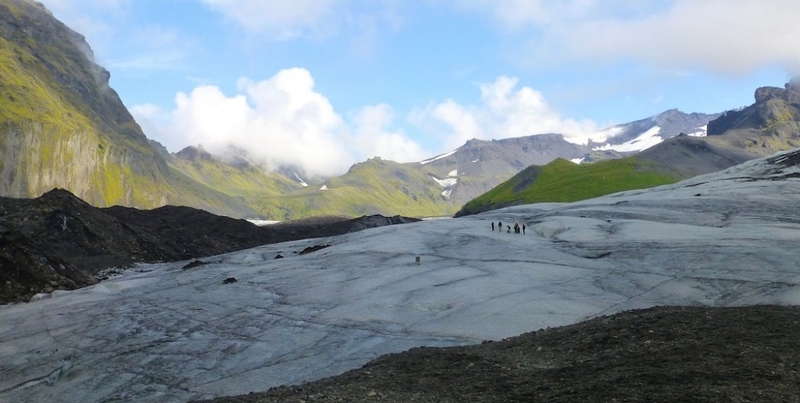 The glacier overall has retreated more than a mile up the side of an ice-capped volcano during the past two centuries, despite a 600-foot growth spurt between 1970 and 1990. The higher altitude portion of the glacier has now detached from its rotting base, the researchers discovered — and sprung back to life. The upper portion has resumed a forward advance that, between 1990 and 2004, had been in reverse. It’s possible that other mountain glaciers are behaving in similar ways, according to Phillips, but more research is needed. If that turns out to be the case, then it could be easy to look at a series of satellite pictures or other glacial measurements and mistakenly think that a glacier is wasting away, when its higher-altitude reaches are actually still active and growing. Understanding processes like these could help scientists hone flooding projections, with the wasting away of glaciers currently responsible for about a quarter of the 3 millimeters or so of annual sea level rise.